So then, brothers, stand firm and hold to the traditions that you were taught by us, either by our spoken word or by our letter (v. 15). When my family and I are in Fredericton, NB (my hometown), one of the places we sometimes go is Wilmot Park. At the park there's a balance beam--one that moves up and down depending on where you step. That balance beam—with its ups and downs—could be a good analogy for life—with its ups and downs. If you’re going to remain on the balance beam, you need to stand firm. The Christians in Thessalonica also lived in unstable times. They were facing persecution, some of them had been deceived by false teaching (vv. 1-3). So the apostle Paul exhorts them to “stand firm” (v. 15). There’s always the temptation to give up (“jump off”) during unstable times. How can we stand firm during unstable times? Here’s another end times error to avoid: disconnecting what the Bible says about the future with how we are to live in the present. Our focus needs to be less on identifying “signs of the end” and more on standing firm until the end. One of the ways we can gain inner strength during unstable times is by remembering the blessings we have from God. 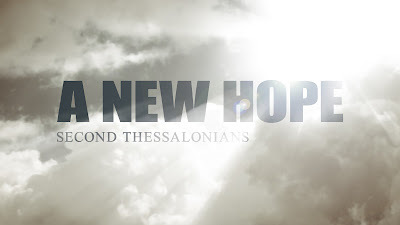 Paul thanks God for two things that he had done for the Thessalonian believers (“But we ought always to give thanks to God for you, brothers beloved by the Lord [i.e., Jesus], because…,” v. 13). We also should thank God that he has done these two things for us: “God chose you” (v. 12), and “[God] called you” (v. 14). Second, God has called us to share Christ’s glory. “[God] called you through our gospel, so that you may obtain the glory of our Lord Jesus Christ” (v. 14). Two weeks ago, I--as a New England Patriots fan--shared in the team's glorious Super Bowl victory. That victory was uncertain (especially when they were losing 28-3 in the second half). But if we believe that God is faithful to his word, then we also believe that in the end, Jesus will win. Every believer will experience that glorious victory. There’s a contrast between the destiny of those who believe the lies of “the lawless one” (vv. 9-12) and the destiny of those who believe the truth of the gospel. (Notice the word “But” in verse 13.) They will be “condemned” (v. 12), while we will be saved. Why did God choose us to be saved and not them? Is that fair? We can’t fully understand how divine election works. What we do see in Scripture is that people are responsible for believing the truth. Those who will not be saved are those who “refused to love the truth” (v. 10). Those who will be saved are those believed in the truth (“belief in the truth,” v. 13). Paul writes, “So then, brothers [and sisters], stand firm and hold to the traditions that you were taught by us, either by our spoken word or by our letter” (v. 15). What Paul taught them (i.e., the gospel) gives us “eternal comfort and good hope” (v. 16). Having comfort and hope helps us to live as we should (“establish them in every good work and word,” v. 17). Thinking again about that balance beam, it would be easier to stand firm on it if you had something to hold onto. To stand firm, we must hold onto the truth. We must continually recall the gospel of God’s grace (“through grace,” v. 16). They had been deceived about “the coming of our Lord Jesus Christ” (v. 1). They had been “shaken in mind” and “alarmed” (v. 2). In the previous sermon (“In the End, Jesus Wins!”), I said that it’s said when we give more attention to a doomed Antichrist than to the victorious Christ. The Father chooses, the Son (i.e., “the Lord”) loves, and the Spirit sanctifies. Evangelism ... Is It Up to Us? In the End, Jesus Wins!